Business credit cards like Chase Ink Business can make it easier for your business to purchase what you need. In this review, we’ll go over what makes Chase Ink useful and explain how it compares to other business credit cards. Read on to find out if Chase Ink Business Cash is right for you. Chase Ink Business Cash is a great starter credit card for a new business. There is no annual fee, and you’ll get solid cash back at office supply stores, gas stations, and more. While this card offers limited travel rewards and other high-end perks, its 0% introductory APR for the first year can make a significant difference for businesses trying to get on their feet. 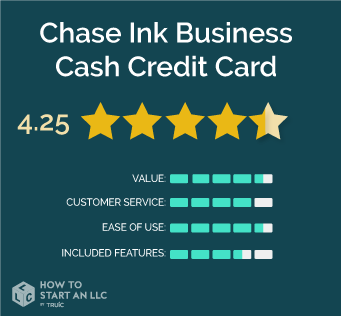 Who is Chase Ink Business Cash right for? Chase Ink Business Cash is ideal for new businesses with low spending needs. As long as you do not need to spend more than $25,000 on office supplies, internet, cable, phone service, and gasoline, this is the perfect card for your first year. No annual fee, so you can keep this card at no cost. 0% APR for the first year. 5% cash back on the first $25,000 spent on office supplies, internet, cable, and phone services. Offers free employee cards for up to 70 employees. Low rewards in general. There are no travel perks, and the highest reward categories have spending caps. Not well-suited for high volume spenders. Capital One Spark Cash offers the highest unlimited cash-back rate among major business credit card providers, with fees low enough to give you some breathing room. $500 cash-back bonus after you spend $3,000 on purchases in the first 3 months after account opening. Earn 5% cash back on the first $25,000 spent in combined purchases at office supply stores and internet, cable, and phone services each account anniversary year. Earn 1% cash back on all other purchases–with no limit to the amount you can earn. $0 Annual Fee + 0% intro APR for 12 months from account opening on purchases. It is hard to get a better value than no annual fee and no APR for a year. Chase Ink Business Cash is excellent for new businesses because it minimizes costs for the first year. If you need to maximize every last bit of funding, this card is worth a look. The downside only applies to businesses spending tens of thousands of dollars on purchases, particularly in rewards categories. For those companies, Chase Ink’s capped spending on rewards and relatively low cash back rates will not provide maximum value. As your business expands, you may want more advanced rewards to suit your changing needs. But with no annual fee, there’s no downside to hanging onto this card. We found Chase’s customer service to be about as good as can be expected from such a large bank. While there is no live chat on the Chase site, they offer phone support, an email hotline, and even a customer service Twitter account to answer your questions. We found Chase consistently got back to us quickly with helpful feedback. Chase Ink Business Cash will make your life easier. You don’t have to pay annual fees, and all your incurred costs are fairly straightforward. Their online platform is easy to use, and they make it easy to cancel fraudulent charges. Another perk is that when you pay for car rentals using your Ink Business Cash card, Chase will cover the cost of any damages. You can set up as many as 70 employee cards for free, each with their own individual spending limits. Chase pays attention to the details, and users consistently find useful features that actually make a difference. Chase’s $500 sign-up bonus (after you spend $3,000) is a nice perk. The 5% cash back rate for office supplies and telecommunication services, as well as the 2% rate at gas stations and restaurants are even better. As long as you spend less than $25,000 annually on those respective categories, Chase Ink Business Cash should satisfy your needs. But as previously mentioned, this card’s cash back rewards and perks are fairly basic. There are no travel rewards except for the gasoline cash back rate. You get access to a great platform with responsive customer support and features, but there’s nothing else to keep high volume spenders around. We recommend using Chase Ink Business Cash as a starter business credit card. With no annual fee, you are incentivized to keep it even if you eventually upgrade, and its intro APR can really save you early on. Using Chase can also help you improve your business’ credit, which will help you access other funding and business tool options down the road. For almost any business, this card is worth exploring.